First published on Truthout February 16, 2016 by Bruce Melton. We were awash for 19 days in a tumultuous sea of mountains and forests, drifting a course through the heart of the US Rockies on a 6,000-mile journey of observation. Our film, What Have We Done, the North American Pine Beetle Pandemic, was released in 2009. It was the story of what is now 89 million acres of forest across the North American West that have been attacked by native insects. These insects had been driven to unprecedented numbers by warming that is twice or more the global average. 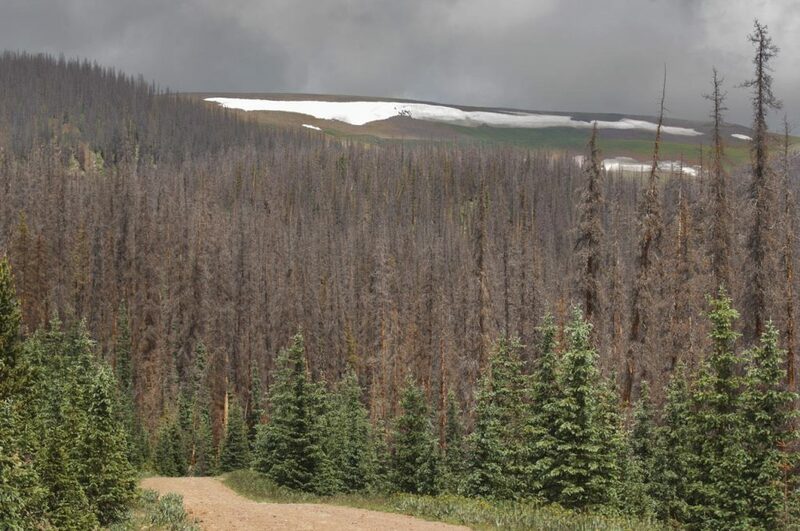 Most of the trees in impacted forests were killed in the wake of the beetles. It has been four years since the Climate Change Now Initiative’s last post-film observation in 2010. Our epic crossing was different on that final journey. The mountainsides of impacted forests were not predominantly bright red. Some were red. Some were brown. And ghost forest of gray needleless conifers at times spread to the horizon.